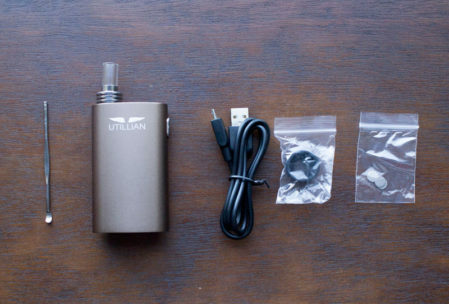 The Utillian 420 vaporizer is the latest release from vaporizer giants Utillian. 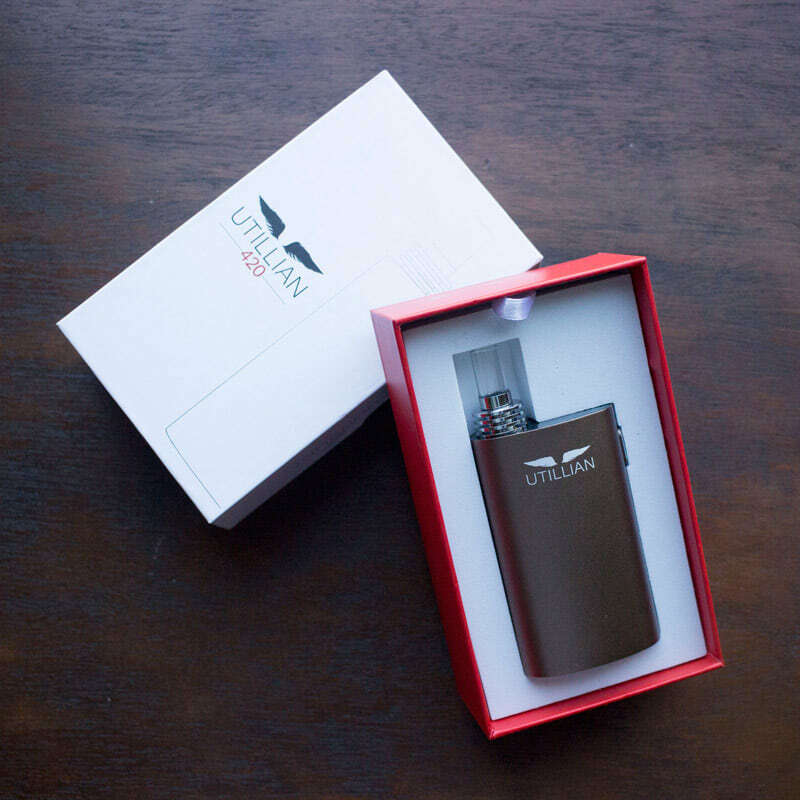 This release comes on the heels of the popular Utillian 721, which has been praised for being one of the most affordable convection vaporizers available. 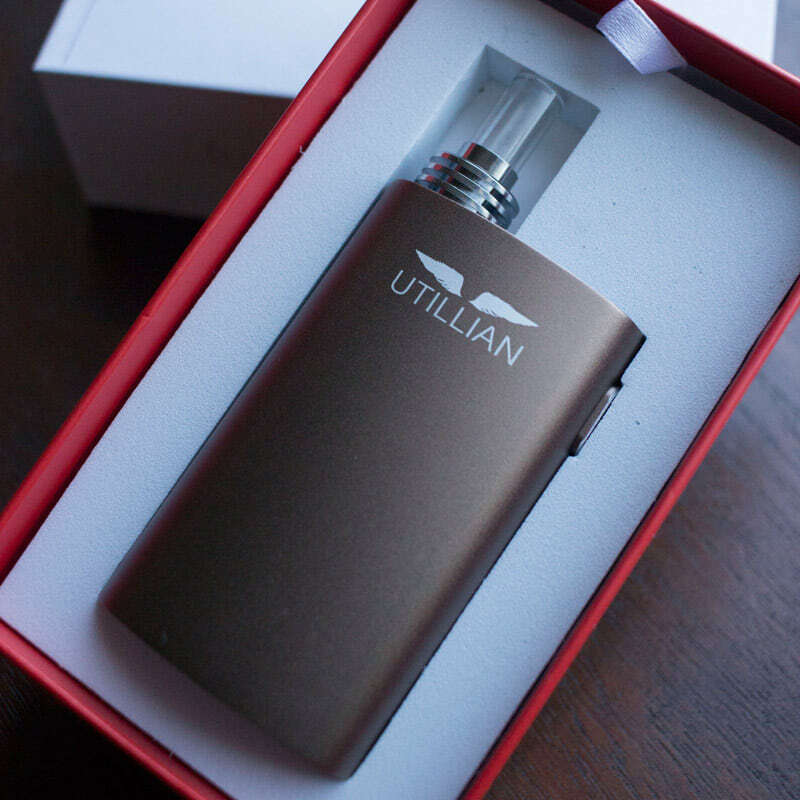 The Utillian 420 looks to offer users the best vaporizer experience on a budget, providing users with four preset temperatures, a large ceramic chamber, glass mouthpiece, and a digital display, all in a sleek, pocket-size vaporizer. 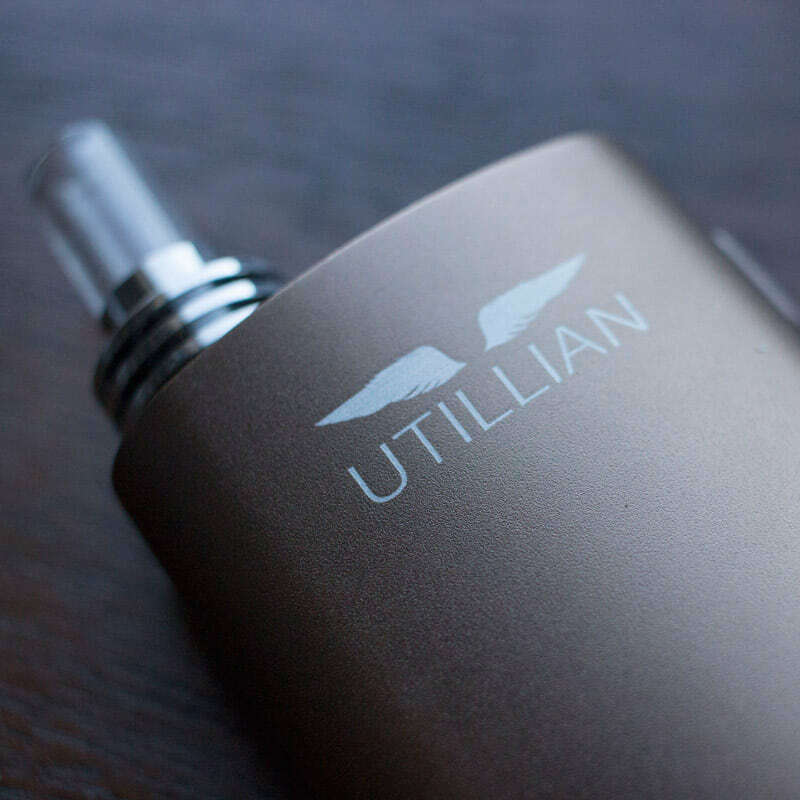 The Utillian 420 comes in a nice, minimalist design with a box-like shape and ergonomic curves. We’ve seen vaporizers like this before. 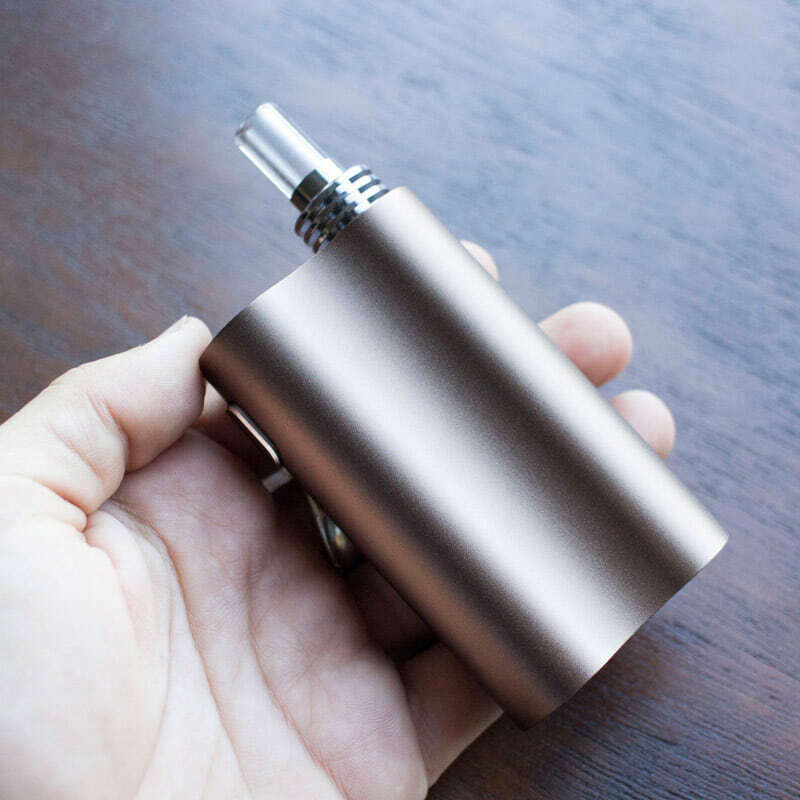 It’s got a familiar flask shape to it (reminds us of the Haze Dual V3 dry herb vape) that sits nicely in the curve of your hand. 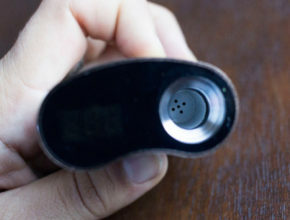 This vaporizer has a single button on the side opposite to the mouthpiece, a digital display, and a glass mouthpiece that is above a sizable ceramic chamber. The outer casing is made of a very durable aluminum. It has a nice finish on it so it doesn’t feel like it’s going to get scratched up easily. It feels solid in your hand as it’s made of sturdy material which has some nice weight to it as well. We enjoyed the minimalist design and the simple one-button interface, which is used to power the device on and off, as well as to cycle between the four temperature presets. The preset temperatures include: 374°F, 392°F, 410°F, 428°F (190°C, 200°C, 210°C, and 220°C). 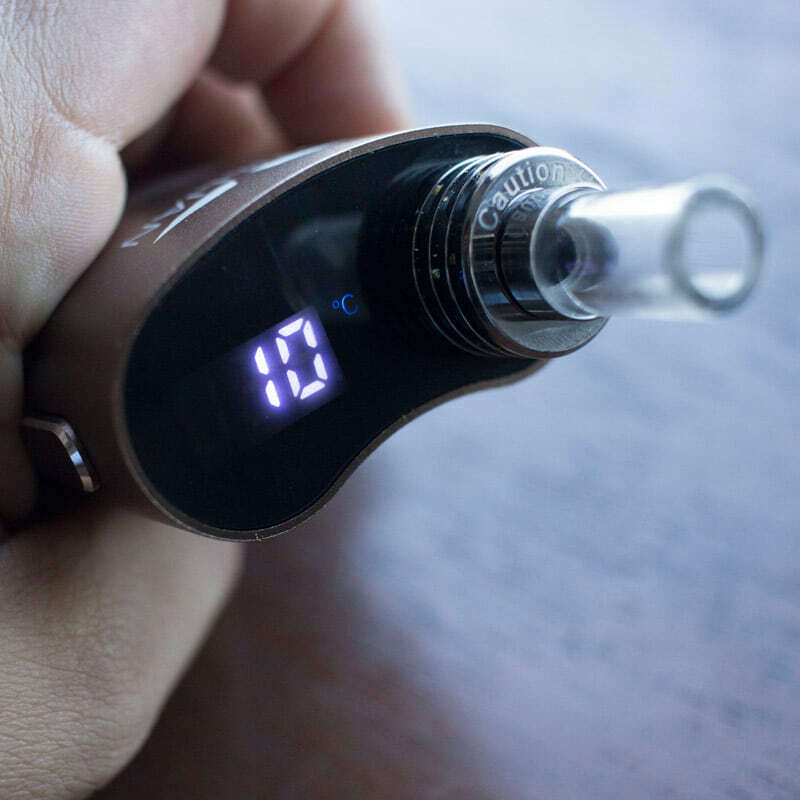 It has a digital display on top that allows you to monitor your battery level and temperature setting, and also boasts a glass mouthpiece that sits atop the chamber. On the bottom of the device, you will find the plug-in for the mini USB charging cord, and a secret dry herb storage compartment that’s about two inches deep. 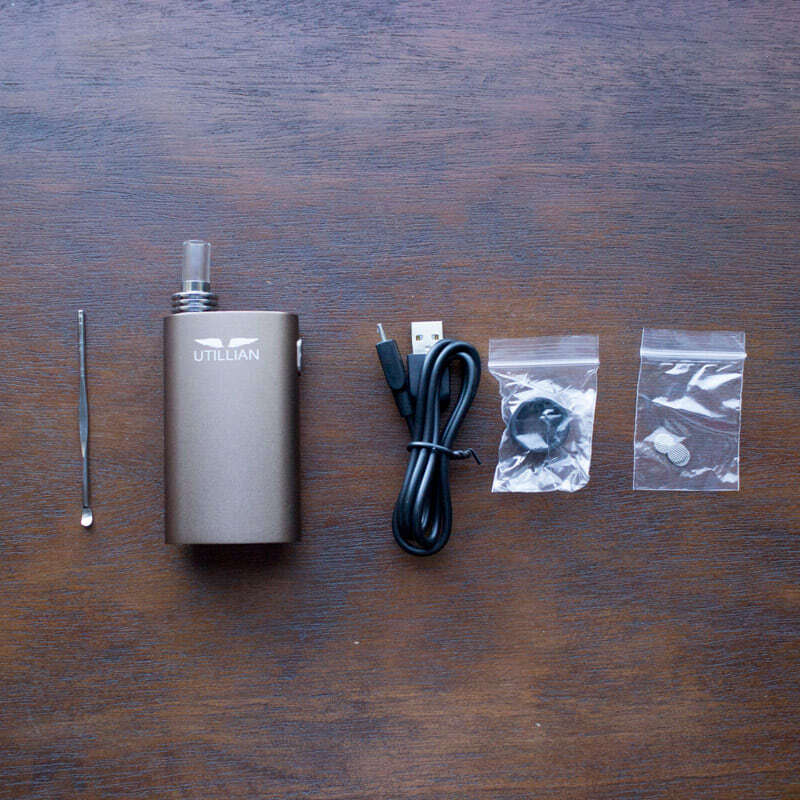 To turn on the Utillian 420 vape, press the power button five times quickly. The LCD screen on the top of the device will illuminate and display the current battery level. Next, the screen will display your last used preset temperature and then it will begin to automatically heat up. An interesting quirk about the Utillian 420 is that it only shows the temperature display in Celsius. Most vapes that display the temperature in °C usually have the option to also display the temp as °F instead. 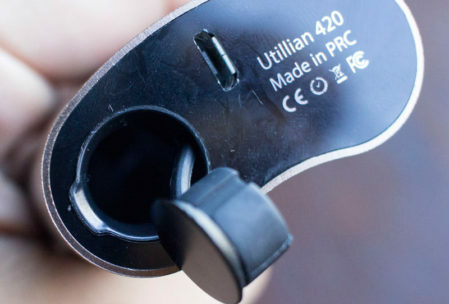 To change the temperature on the Utillian 420, simply press and hold the power button for about 3 seconds. The display will then show you the next preset temperature and will begin heating. Repeat this process to cycle through each of the four temperature presets. Loading the Utillian 420 is very straightforward. 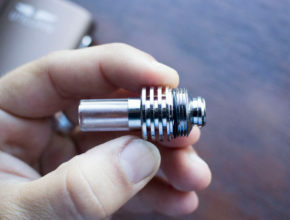 Simply unscrew the glass mouthpiece to expose the ceramic heating chamber. 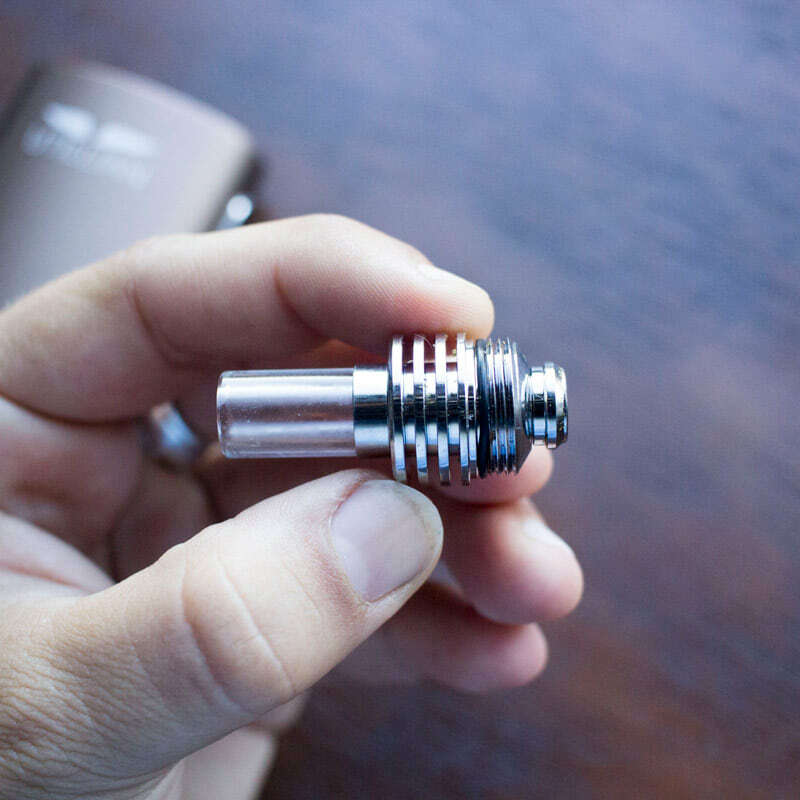 After you’ve packed the chamber with dry herb flowers, simply screw on the glass mouthpiece back on, wait for the vape to heat up, then begin puffing. The device will automatically turn off after five minutes of operation. To turn the Utillian 420 off manually, simply press the power button 5 times again. The device will show you the current charge level once again before shutting down. 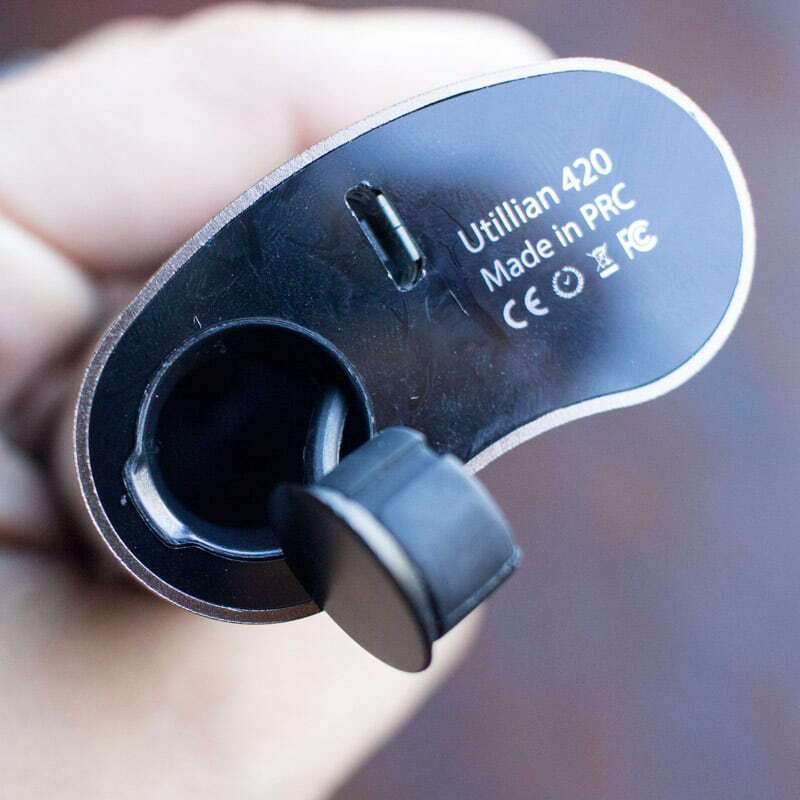 Seeing as the Utillian 420 is a conduction-based vaporizer, we made sure to grind our herb up more finely and pack it in pretty tight inside the chamber. We set the Utillian vape to 200°C and took a sizable inhale. The first draw was smooth and had a lot of flavor, which was a little surprising since the chamber is located directly under the mouthpiece. 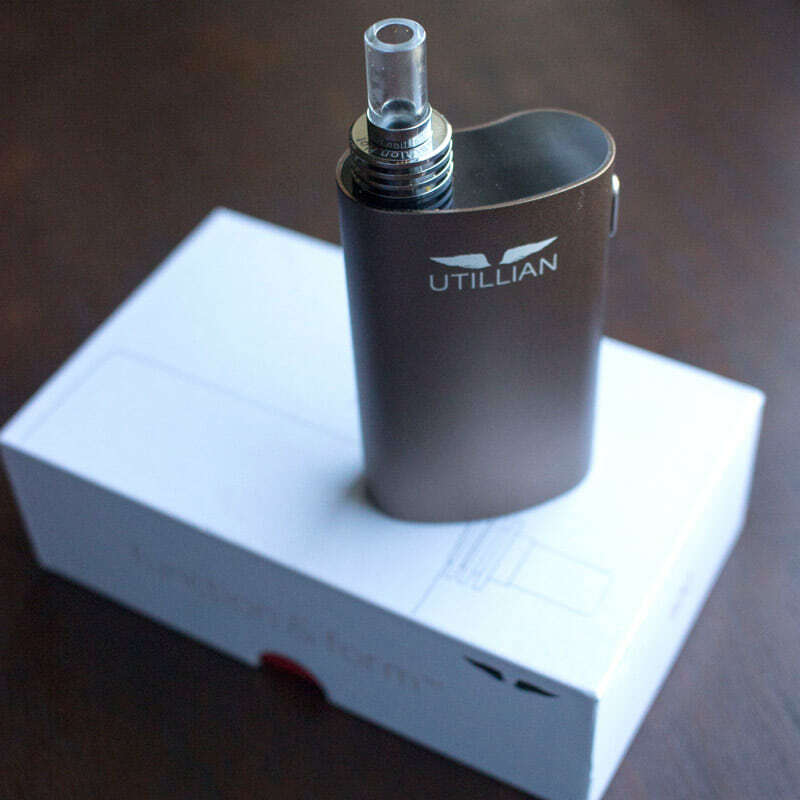 This placement would typically cause the vapor to be a little hot and have harsher flavor, but that wasn’t the case with Utillian 420. The second draw seemed a little bit bigger and denser. 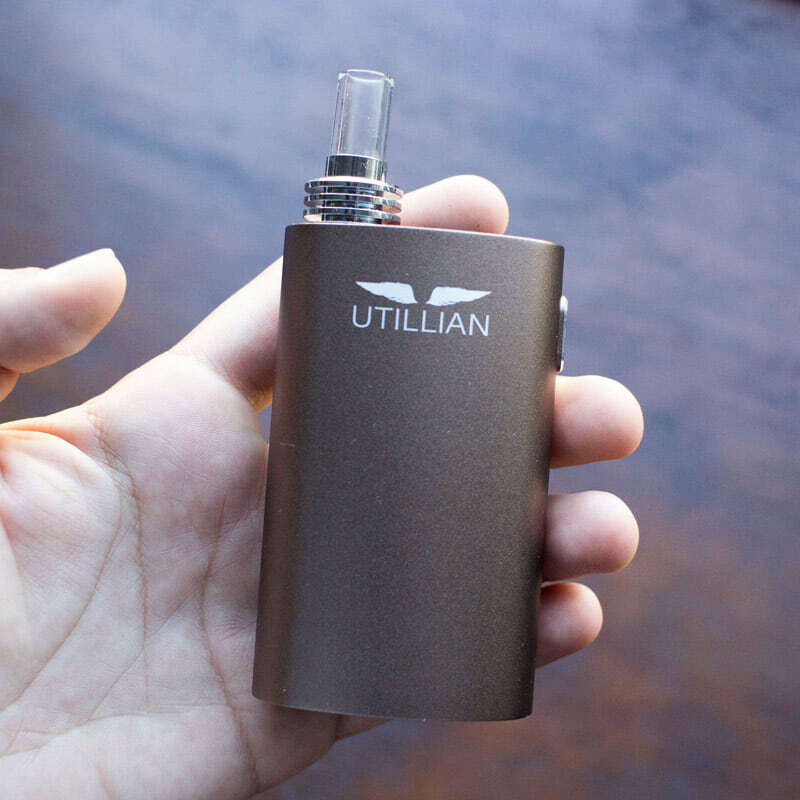 Conduction-based vaporizers, especially ones that are on the lower end of the price spectrum, like the Utillian 420, tend to need a little more time to heat up, so it makes sense that the third or fourth pulls will exude a larger amount of vapor. We then changed the temperature to 220°C (about 440°F) and took a third draw, which to our surprise, the flavor was still noticeably good-tasting and the actual vapor did not cause any throat irritation. The vaporizer had been on for a few minutes at this point and the body was a little warm, but there were no parts on the vaporizer that ever got too hot, so there’s no chance of actually burning yourself. 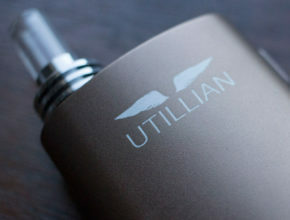 We found the Utillian 420 vape to be most enjoyable at the 200°C and 220°C temp settings. For the price of the Utillian 420, we were not expecting much in the vapor quality department. But this budget vape does an excellent job at transferring flavor and the glass mouthpiece is a nice touch, allowing the purity of quality dry herbs to flow through. 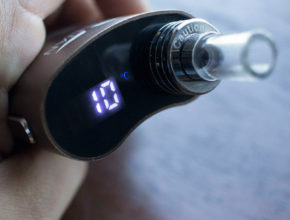 At higher temperatures, you will be able to enjoy some nice, dense vapors without experiencing much throat irritation. The vapor seems to cool a decent amount as it passes through the glass mouthpiece. 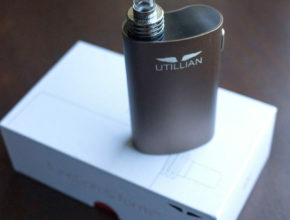 The Utillian 420 vape has a built-in battery that can not be removed. 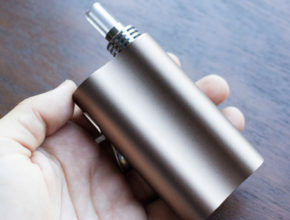 However, for such a small vaporizer, this vape has an impressive battery life, lasting roughly an hour. 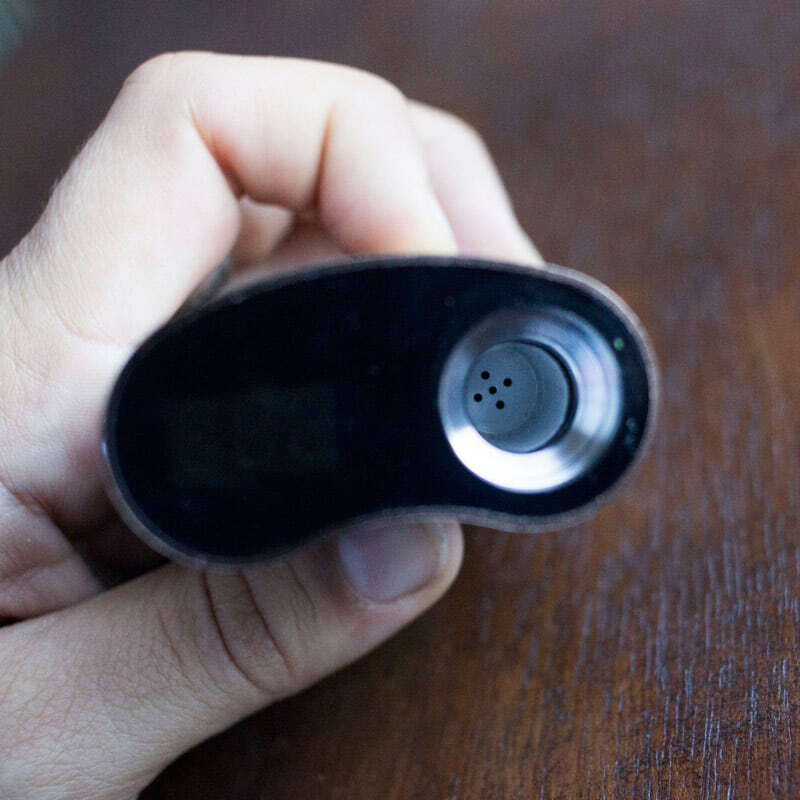 Considering a typical session with the the 420 vape lasts about five minutes, this will get you roughly four to six sessions on a single charge. 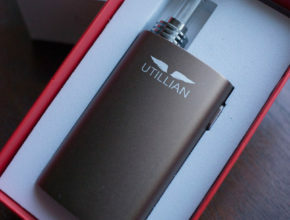 At under $100, the Utillian 420 vaporizer is a great, entry-level dry herb vape. This vape really gives you a lot of bang for your buck. 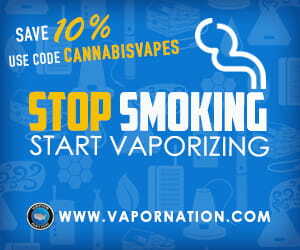 It does a great job at providing great vapor quality in terms of vapor size and transfer of flavor. 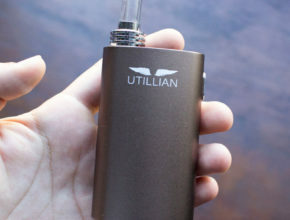 The Utillian 420 is by no means on the same level as the high-end dry herb vapes like the PAX or G Pen Elite, but for the cost and simplicity, it’s worth it. 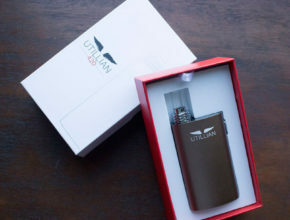 The Utillian 420 dry herb vape retails for $89.95 and can be purchased through Canadian based retailer TVape. 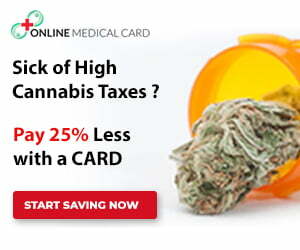 It can be shipped anywhere and includes a 30-day warranty.